Purple is one of my favorite colors. 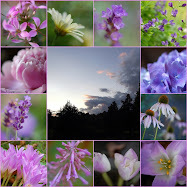 I especially love purple flowers of any kind. The dark raspberries look delicious, we saw while out hiking this morning. Lovely photos and mosaics, Mary! Thanks for hosting and I wish you a happy week ahead! Purple is indeed, a difficult one, as far as fruit and vegetables go, but your mosaics definitely depict that mood, texture and drama inherent in this hue. Thanks for hosting! This is beautiful. Love, love purple and all it s hues. Your photographic vignettes are fabulous!! Love this! Eggplant is definitely purple! Purple is really hard to photograph - sometime the colors get wonky. Yours are perfect! Have a great evening, Mary! Your photos are GORGEOUS! The color and lighting make for a beautiful vignette, lovely! Your purples are just lovely! The silver tea server in the background is also so beautiful! I think you did a fine job! Kudos! I hope that you make a book when you are all done with these wonderful photos...each week is more exquisite then the next! 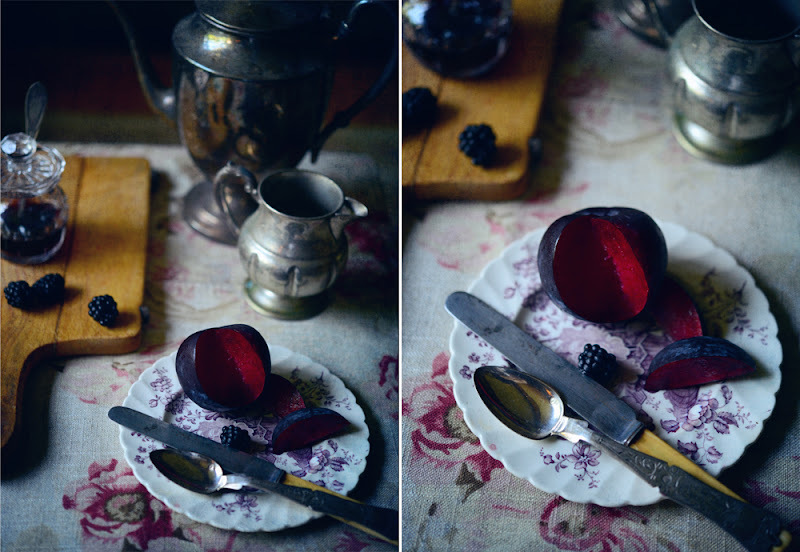 I love the purple and all the old metal tableware. It looks so colonial and pretty. Well there I am...no worries. Your photography reminds me of the 'masters' and their painting ~ Lovely mosaic photography ~ Happy Week to you. classic still life - I think a painter is going to paint this scene. Beautiful, and I love the lighting. This is so beautiful! Love the colors and the composition! Your photographs look so beautiful, like paintings. Mary, your photos are so beautiful! Magazine worthy for sure, and I agree that they are very reminiscent of the 'old masters' paintings. Love the mosaic. Thank you for hosting Mosaic Monday, it's been quite a while since I've been able to join in. Ve your beautiful purple still life vignettes, Mary! They look like paintings from a Master. 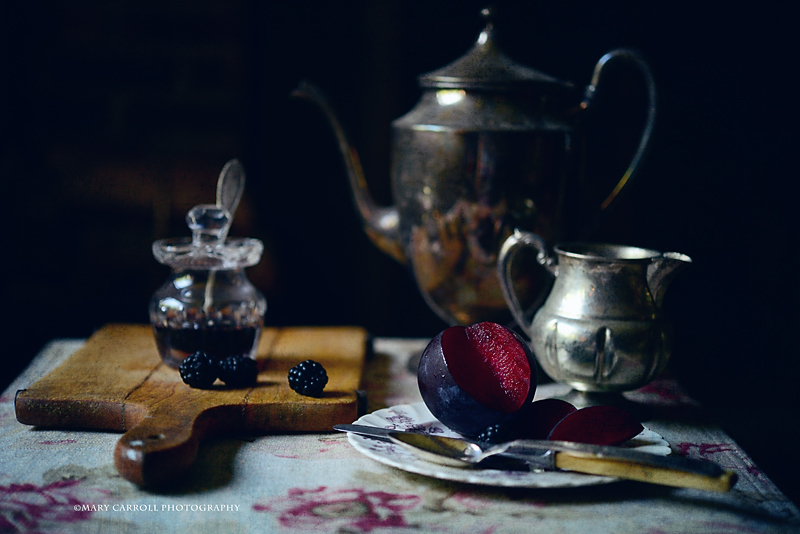 Your still life shots are wonderful with so many different shades and layers of purple, textures, light & shade. Stunning. It has been a while since I was able to join Mosaic Monday. Thank you for hosting and I look forward to viewing the pretty mosaics everyone has created. 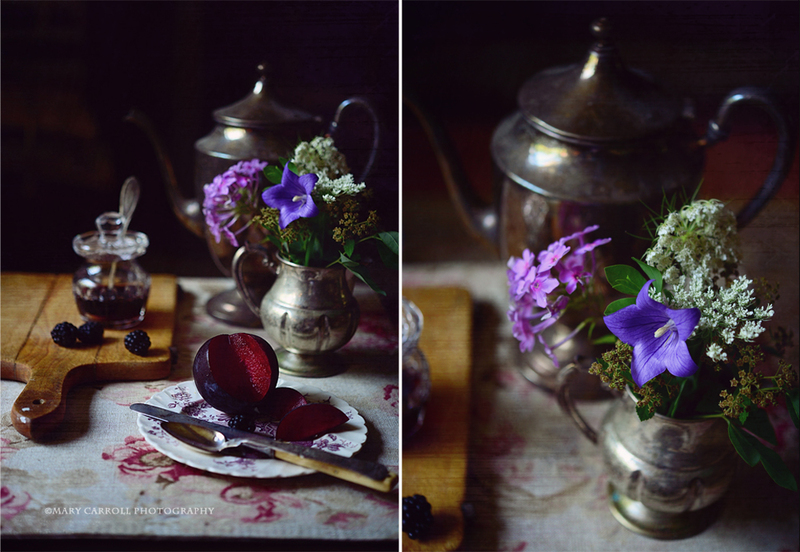 I have always heard, that when it comes to food photography, that blues and purples are the hardest to capture. Your work never ceases to amaze ME! What a beautiful vignette! Your pictures always make me think of oils they are so beautiful.. I'm sure I'm not the first to say that the still life is reminiscent of the Dutch masters - gorgeous depth and colour! Such wonderful mosaics you created. Treasures. Thank you for hosting Mosaic Monday. As always a treat to join in. Thanks for hosting Mary, I love making mosaics and joining in. I adore your subject matter for the Color Purple, dear friend!!! The plums and the jar of jam make me swoon!!! The mosaics are really intriguing...I wish I had MORE free time to try it! !